Filter Forge, Inc. yesterday released the fourth and final beta test stage of Filter Forge 2.0, a high-end plugin for Adobe Photoshop allowing computer artists to build their own filters. The final beta introduces Lua scripting, which allows users to write and execute their own code right in Filter Forge. Additionally, Filter Forge 2.0 is now available for preorder at a special price. Lua scripting allows users to implement their own image generation algorithms as custom Filter Forge components. Lua scripting is the single biggest feature of Filter Forge 2.0. You're not limited to Filter Forge's built-in image processing tools anymore -- now you can make your own tools! Filter Forge, Inc. yesterday released the fourth and final beta test stage of Filter Forge 2.0, a high-end plugin for Adobe Photoshop allowing computer artists to build their own filters. 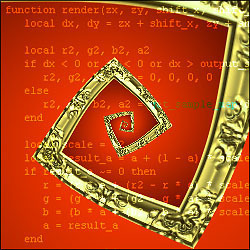 The final beta introduces Lua scripting, which allows users to write and execute their own code right in Filter Forge. Beta Stage 4 wraps up the Filter Forge 2.0 beta testing period with the introduction of Lua scripting, which allows users to implement their own image generation algorithms as Filter Forge components with custom inputs and internal logic. Lua is a blazing-fast scripting language held by numerous developers as a number one choice for embedded scripting, as evidenced by its use in best-selling games such as World of Warcraft and Crysis and high-profile graphic software such as Adobe Lightroom. "Lua scripting is the single biggest feature of Filter Forge 2.0", said Vladimir Golovin, CEO of Filter Forge, Inc. "You're not limited to Filter Forge's built-in image processing tools anymore -- now you can make your own tools!" The beta version is available at http://www.filterforge.com/download/beta2/index.html. The beta is a fully functional 30-day trial version of the Filter Forge 2.0 Professional edition. All registered users of Filter Forge 1.0 can get a free beta key that allows them to use the beta version until the end of the beta period. The commercial release is planned for late June 2010. Additionally, new licenses for Filter Forge 2.0 and upgrades from Filter Forge 1.0 to Filter Forge 2.0 are currently available for preorder at a special price -- you can save up to $170. The offer is valid until the commercial release of Filter Forge 2.0 in late June 2010. To preorder Filter Forge 2.0, click here: http://www.filterforge.com/buy/. To preorder an upgrade from Filter Forge 1.0 to Filter Forge 2.0, click here: http://www.filterforge.com/buy/upgrade-v2.html. Filter Forge is a versatile Photoshop plugin which lets both novice and expert users create a wide variety of realistic and abstract textures and effects. Users can take instant advantage of over 7000 free community-created filters in the online filter library at http://www.filterforge.com/filters/, or create their own filters in the visual filter editor by assembling them from components such as blurs, gradients, color adjustments, noises, distortions, or blends -- and, starting with this beta, Lua scripts. Most of the filters are seamlessly tiled and all of them are adjustable, resolution independent, support real-world HDRI lighting, and can automatically generate diffuse, specular, bump, and normal maps.